Working weekends. For seven years I worked nights and weekends so I do everything I can to avoid that now that I’m finally on Monday through Friday. There were a couple of overtime opportunities in Lansing this past weekend and I really like the co-worker that I would be working with. We could use the extra money and they were going to be easy days, so J told me to take it. I got done with work just before 5:00 on Saturday and started on the trip home. Since I was gone, J took the kids over to a friend’s house to play. I said I’d just grab something to eat on the way home since they were getting pizza where they were going. I could have picked up a pizza in Lansing but what fun is that? I’ve eaten at most of the pizza places in town. I started looking along my route and came up with something in Charlotte. Riedy’s Tavern is in downtown Charlotte on Cochran Avenue south of Lovett Street. The restaurant takes up the bottom floor of two buildings. 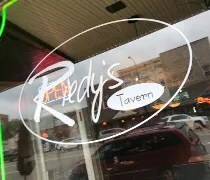 At one time, the two spaces were separate but it appears Riedy’s expanded at one point and went from being Riedy’s Pizza to being Riedy’s Tavern. Riedy’s was one of the first places I found when I started looking and when I got there I stopped looking….because they have online ordering. A pizza place with good reviews and I don’t have to talk on the phone? Yeah….that’s where I ‘m going. 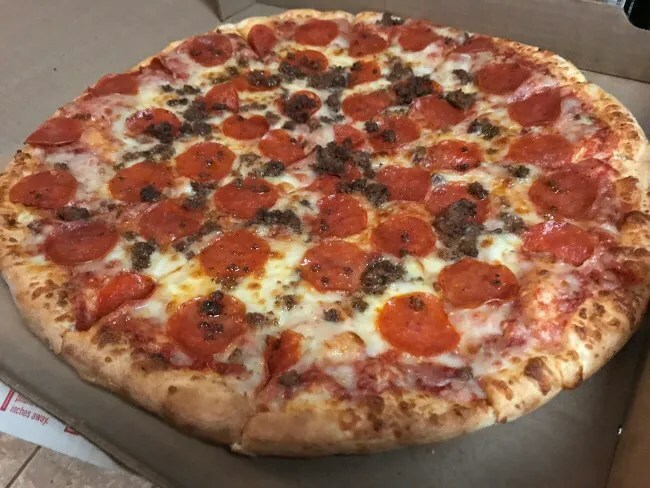 I put in an order for a 16″ “Original Round” pizza with pepperoni and ground beef. The cost, with tax and processing fees came out to just under $20. The e-mail said it would be about 25 minutes and I was sitting in a parking ramp in downtown Lansing about 25 minutes away so it worked out perfectly. The restaurant is downtown so street parking is the most likely place to find a spot. My GPS actually put the building a little bit further south than where it was. I couldn’t find a spot near where the GPS said it was so I kept going north and pulled in. Turns out, I parked right in front. 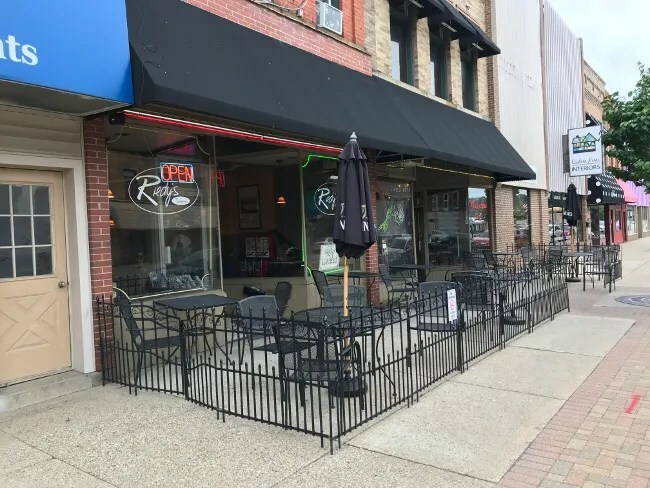 The entrance to the restaurant is through a pretty large outdoor patio on the sidewalk in front of the building. 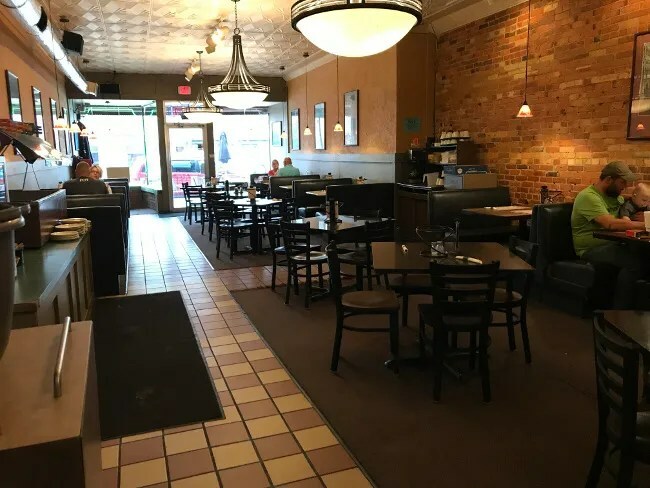 The dining room is a gorgeous old building with checkered tile floors, exposed brick walls, and a stamped tin ceiling. There are booths on either wall with a row of tables down the middle. There’s a small doorway that leads into the second building where the bar as it. The back of the dining room has a small metal work table with a cash register. I headed there to pick up my pizza. Three different waitresses walked right by me before someone finally looked around the corner and got a different person to come out and finish my order. I paid the bill here instead of paying online although I still paid it with my credit card. I grabbed my pizza and declined napkins and plates because I was heading home to eat. I got all the way back to Kalamazoo before even opening the box and the pizza stayed pretty warm. The pizza looked like a typical delivery pizza but it didn’t taste like that. The crust and sauce is both made in house and the mozzarella used is fresh. There is a distinct tanginess from the sauce that really made this pizza stand out. 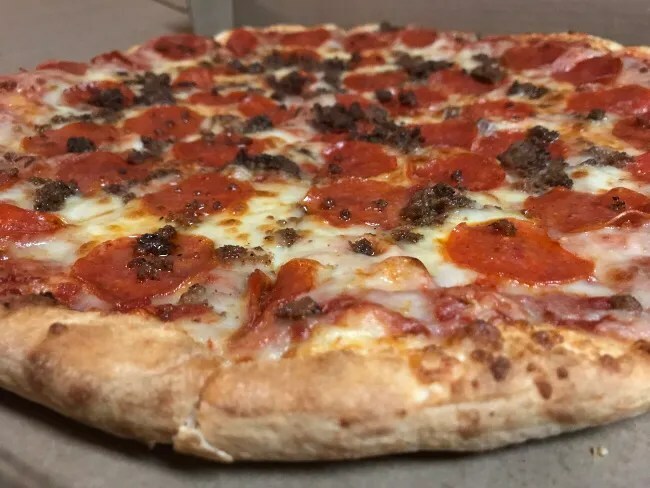 The grease from the pepperoni and the ground beef also added a layer of flavor. The crust wasn’t quite thin but not really thick either. It was soft and chewy but not super doughy if that makes sense. It was cooked all the way through but retained a softness that made it easy to eat but held up to the thick layer of toppings it was tasked with holding on to. I had no idea what the expect from Riedy’s Tavern. I almost missed them because they came up as “Tavern” and not “Pizza” when I was looking for pizza places in Charlotte. The pizza turned out to be really good. 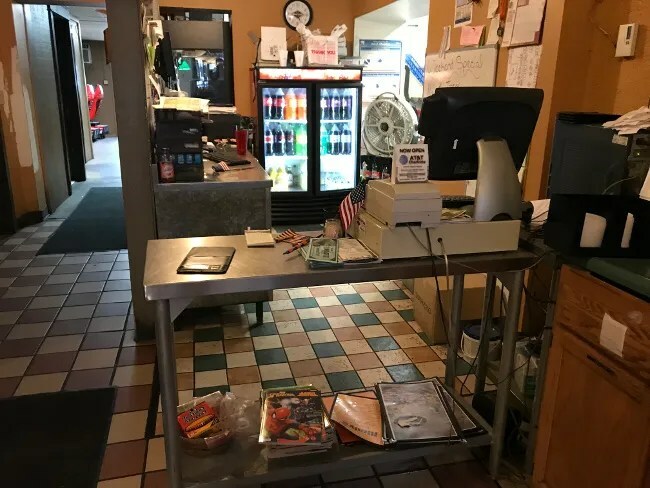 They’re one of those hometown pizza places that has been in the community for several decades and it’s easy to see why. This is good pizza. I had a long day working in Lansing and this was a perfect way to end that long day.